After I ran a big personal best early this month, I was decide to start a three-week try out on track with GRCrs; but Coach Jerry and few other friends didn’t recommend me to do so. That was the reason I didn’t show up at BCC on Wednesday after I accepted that suggestions and did not run anything fast. Since then I been running easy on my own pace for few weeks by logged no more than 30 miles per week. Yesterday was Memorial Day and I put on my racing flat in MCRRC Memorial 4 Miler. My legs were hungry for speed and ran a new personal best in that distance. As “GO” was announced, I ran out with group of ten and clocked 5:39 at mile 1; but hot and humid condition push me slow down after the first turn around. I clocked 5:59, 6:20, & 6:39 for mile 2, 3, & 4 respectively. I finished with 24:39, 12th overall and gender, and 1st in AG. However, I believe I should be able to run faster than that, if condition is right, perhaps break 24 minutes. I’ll see about that in the DC/MD/VA famous MCRRC Capital Crescent Trail 5K on June 5, where I will try to run a new personal best of 17:58 ~ 18:15. I am starting my training schedule for fall marathons this weekend. 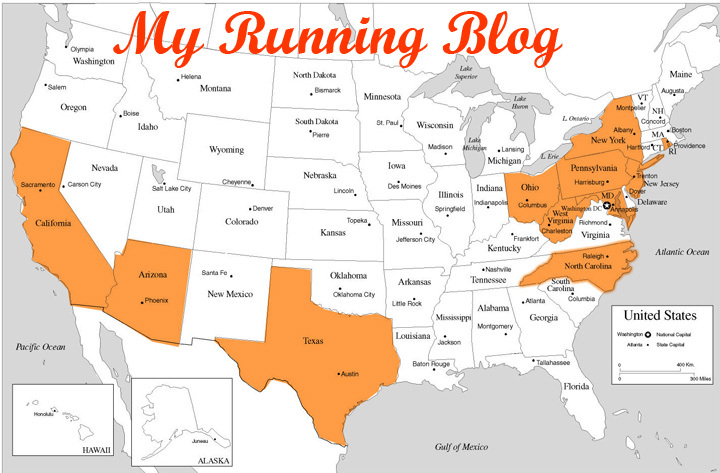 I plan on run Akron Marathon on September 24 as training run (3:10 ~ 3:20 finish) and Tucson Marathon on December 11 as PR target race (2:53 ~ 2:56 finish). I already book my flight to Tucson and secured my bunk at my college buddy’s home; so that marathon is a sure thing if everything as schedule. Several friends recommended me to train with a coach to reach a new high in marathon; but I think I am continuing to self train. I think I know about myself better than anyone else. I know is good to have coach, but if I do, that force me to follow other’s schedule and lack of freedom on my side. Beside I don’t know I can put up with someone else after several years of self train. Since I fail to show up at track and unlikely will show up there in any near future, then I will do mile repeats on Matthew Henson Trail on Wednesday’s morning. I am target to run 2:55 marathon in Tucson Marathon, which 6:40 per mile and I will train for that pace. I will have better idea how my body able to do in the next two months or so. However, I will continue to do weekend long runs with GRC, since I truly enjoy that very much; also, if you wanna train for Tucson together, that would be lovely as well.